I think I know the answer but want to ask to make sure. Does a proxy need to have a PVA? No. A message proxy does not need a PVA. no, it does not. The Service URL could very well be a real (as opposed to a virtual) asset. I thought that was the case so i must be doing something wrong. I can call the proxy just fine but when I try to call the real endpoint(outgoing) it keeps automatically putting in a "port" when I save. What am I doing wrong? I do pass in a parameter. Picture attached. Proxy URL (the one which you are creating) will always use Virtualize Server port, as you are running such proxy on Virtualize Server. The real service definition will need port if is not standard. As you provided protocol (http in your case) proxy automatically "translate" it into default port of http. Do you have any problems with using 80 port when proxy send a request? Based on the screenshot was the question about why port "80" is being added to the "outgoing connection" in the bottom half of the screenshot? If that is the case the port "80" is being shown there to be clear about the default port will be since in the connection settings the "Service port" field was left empty. We prefer to show a port to help make it clear where Virtualize will send the request. If port 80 is not the port desired then please fill in the "Service port" field with the actual port. @reactancexl You don't need a port as by default http will use port "80". However as it been said the port in proxy is only for information purposes in your case. It will not harm your communication. 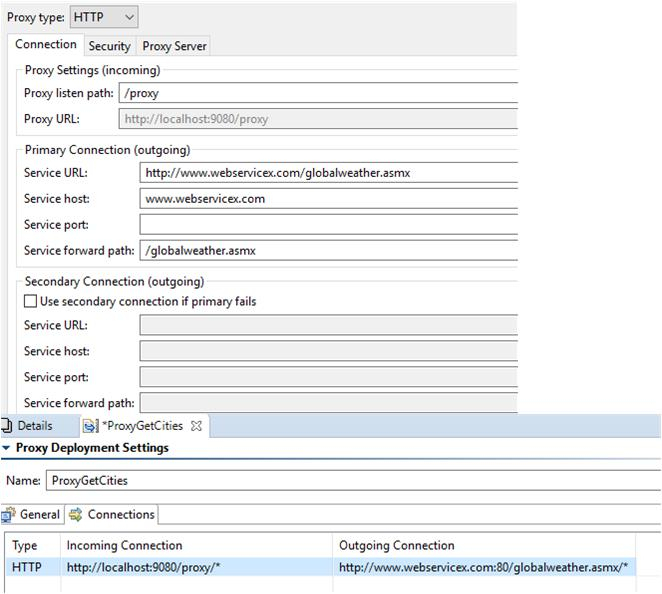 So in you case to reach that "outgoing" service you need to use a network proxy but when you configured the settings on the "Proxy Server" tab it is still unable to reach the service? Could you include a screenshot of the "Proxy Server" tab? From what I can see it looks to be configured correctly. Would it be possible for you to contact support? I think it would be easier for someone to connect with you to investigate and gather details.